I'm back to Singapore again after a considerable long break for Chinese New Year. The weather seems to be hotter now, and I'm not liking it. I wished it could stay 25 - 26°C all year long. The last I checked, it was 33°C. Damn hot laaa! I'm in dire need to cool myself. Switched on the aircond, set it to 18°C but the air doesn't seem to be cooling enough for me. I almost wanted to shut myself in the refrigerator, then I thought of my grandma's bedak sejuk which I got it from her during my visit to Ipoh on CNY! Wow, this got to be my skin saver (no joke). It took my grandma 6 months to make those skin saver, okay. I took out a small piece, place it on my palm and add in 6 to 7 drops of cold water to make it into runny, watery paste before slapping it onto my face, neck and arms! While doing this, I sat in front of the aircond for maximum syiok-ness! 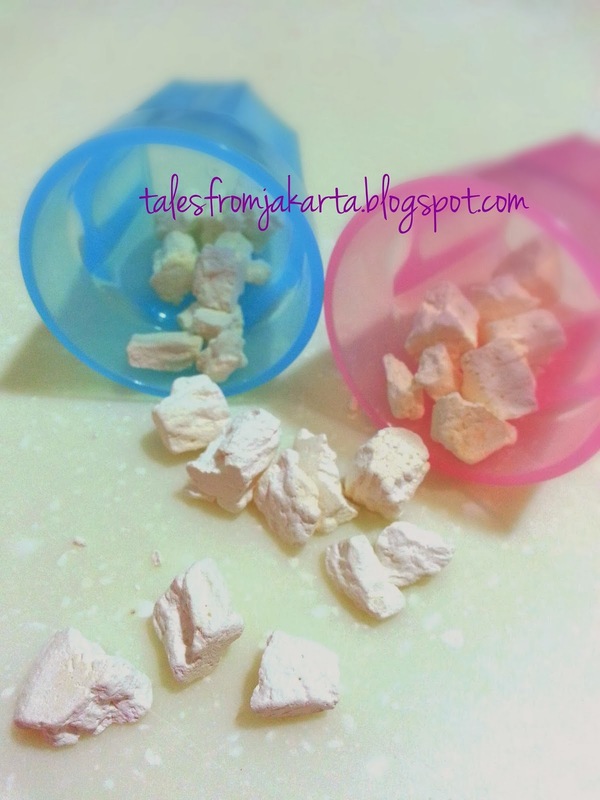 I have been using bedak sejuk (direct translation: cooling powder) ever since I was a toddler. They do not have miracle creams or face mask back in those ancient days when grandma was young. Just like everyone else, grandma made her own. Have you heard of using rice water for clearer and brighter skin? What about fermented rice nutrient called Pitera that every beauty junkies would pay a bomb for? Tsk... my grandma's cooling powder has it all! So, allow me explain briefly how it was made and what it is good for. Raw rice (grandma used white rice) is soaked in the water for 6 months until all the rice are fermented, dissolved and turned into white sendiment at the bottom of the 4-inches deep tray. She would change the water once a week. 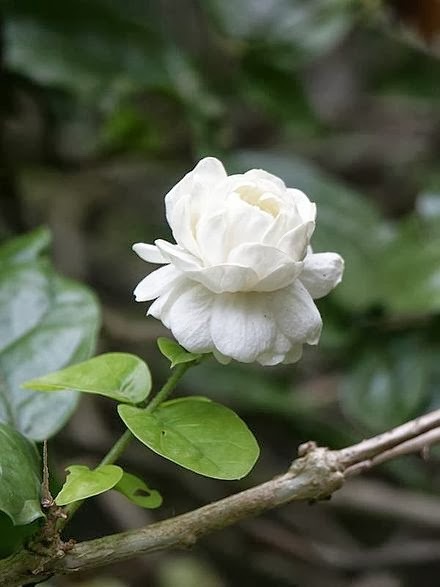 At the end of the 6th month, she poured away the excess water and added in white jasmine flowers to the sendiment before drying it under the sun. Once the sendiment is completely dried, she would break them into small pieces before storing them in an air-tight container. I remembered the whole kitchen would stink when the fermentation took place. 1) Preventing heat rash (prickly heat) on skin. 3) Control excess sebum production on oily skin. 4) Improves skin texture for sure! You should see my grandma's skin. She's 83 but her skin's as smooth as my 3-year old. (It is 100% au-naturel so don't expect overnight miracles with short term usage). Now that she doesn't live with us anymore but in Ipoh, I missed her nyonya cookings, bedak sejuk and homemade aloe vera gel mask very much. But above all, I miss her the most! Hi! I'm wondering if I may contact you. I'm a Malaysian living in Singapore right now. Lately I decided to remake the cooling powder by memories of what my grandma did. I searched the Web for ways to make it. Today I manage to get my produce after about 1 month ( some says can just do it 3 days). it's not like what I remember. Asked mum but she's not sure. I remember that my grandma always leave it out under the hot sun but from Internet said to leave it under the shade. May I know how your grandma made hers? My grandma soaked the white rice for 6 months. Every week, she'll change the water once. I remember her leaving the soaked rice indoor (not under the sun). By the end of 6 months, she'll bring the melted rice out in the garden to dry it under the hot sun. But I guess a faster way is to grind the rice into slightly coarser form and soak it for a month or so.